Scheduled ride dates are posted many months in advance . Details related to these ride dates will be posted no less than 5 - 7 days before the ride or sooner if that is possible. While the calendar will provide sufficient detail to get you to where you need to be and when you need to be there to join any given ride, for full details, you will need to check the forum or be on our mail list. Rides are cancelled in adverse weather conditions and will be rescheduled if and when possible. This calendar (and our forum) will be updated to show any cancellations if one is to occur and Hillel's Angels members will receive email notification of ride cancellations. 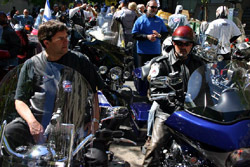 Additional "special event" rides, and other non-riding events may be added to the calendar but notice of such events will always be available on the forum or by email to Hillel's Angels members. Remember that many great rides just come together on the spur of the moment and these will not be posted to the calendar. Check the forum for these spontaneous rides.